Have you ever heard of Nikola Tesla? Nikola Tesla has invented the technologies on which our modern world is built. Scientists are still discovering what Tesla has predicted, are still studying his theories and research. His work is still, in many ways, future technology. Nikola Tesla had an amazing mind, he was a scientist, an engineer, an inventor, a mystic and poet. His mind was too great to be fully appreciated by the people of his time. During his lifetime he patented more than 700 inventions. A list, by no means complete, of the inventions which still power our world today. 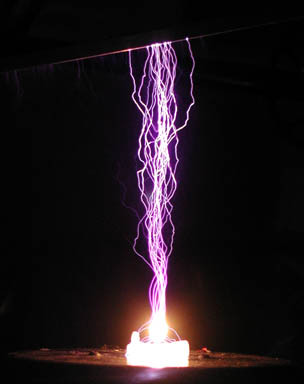 Tesla is also the inventor of the Tesla-Coil, without this device none of our electrical apparatuses would function. And yes, dear readers, that includes our laptops! So you might still think that it was Marconi who invented the principals of radio-transmission, but in fact Tesla had the first patent. The American patent office later gave the patent to Marconi and Tesla spend many years fighting this decision. In December 1901. Marconi established wireless communication between Britain and Newfoundland, Canada, earning him the Nobel prize in 1909. But much of Marconi s work was not original. Many theories and parts to build a radio were inventions by other people. The heart of radio transmission is based upon four tuned circuits for transmitting and receiving. It is Tesla’s original concept, demonstrated in his famous lecture at the Franklin Institute in Philadelphia in 1893. The four circuits, used in two pairs, atre still a fundamental part of all radio and television equipment. 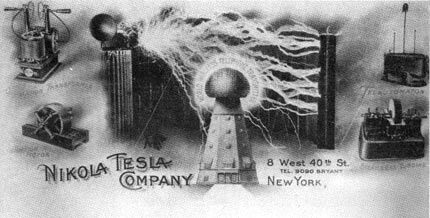 In 1943, six months after Tesla’s death, the United States Supreme Court recognized Tesla’s more significant contribution as the inventor of radio technology. Tesla’s letterhead, showing the the antenna of Tesla’s “World’s radio station” which he constructed in Long Island in the vicinity of New York. 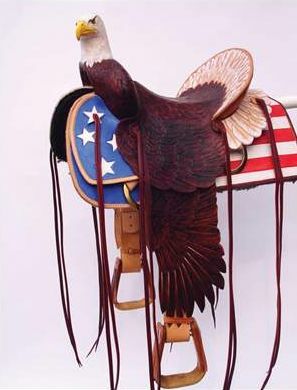 It testifies his farsightedness and ingenuity. His idea was that this station, build in 1900 should by remote wireless control transmit throughout the world not only the news but music and photographs as well. However, that great plan could not be carried out because when it was realized free unmetered energy would also be made available (the tower would also send out free electricity) to everyone Tesla’s funding was terminated and his tower was destroyed. Yes friends, think about that. This project was destroyed because everybody would get free energy, and Tesla’s partner JP Morgan wanted money. Metered energy for which you could charge people. And Tesla never got a Nobel prize. He should have gotten about ten at least. 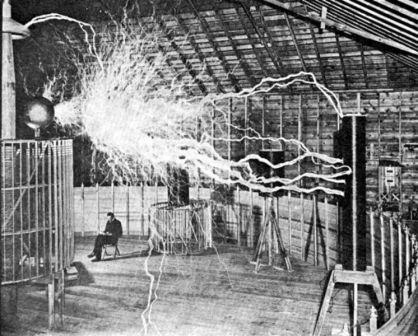 Tesla dreamed of free power for everybody, he believed that electrical power could be drawn freely from the potential electricity in the area above the magnetosphere. Actually Nasa has now done this using Tesla’s research. Our AC electrical power is the result of Tesla winning a huge fight with Edison, who wanted electrical power being delivered by DC. Now DC has a much lower voltage and cannot be send over large distances, (more than 2 miles) like AC can. If Edison had won we would need a power station every two miles, so really the use of Electricity would never have become widespread. At Niagara Falls, Tesla was the first to successfully harness the mechanical energy of flowing water. Change it to electrical energy, and distribute it to distant homes and industries. His revolutionary model set the standard for hydroelectric power as we know it to day. 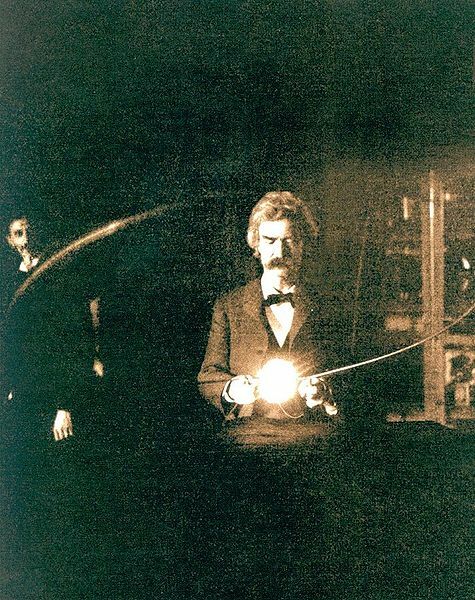 Since his childhood, Tesla had dreamed of harnessing the power of the great natural wonder. And in late 1893, his dream became a reality, when Westinghouse was awarded the contract to create the powerhouse. It was the most likely power source for Tesla’s wireless powered car…. 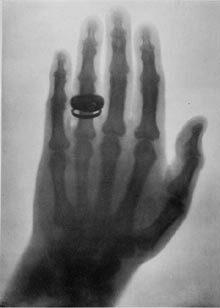 Tesla was working on X-ray photography at the same time Röntgen was. He send his photographs to Röntgen. 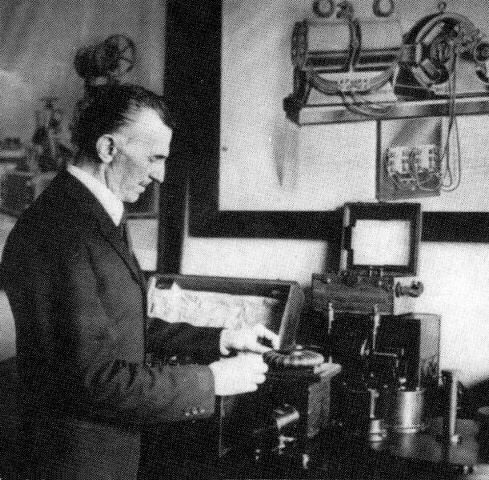 Tesla in his laboratory in Colorado. 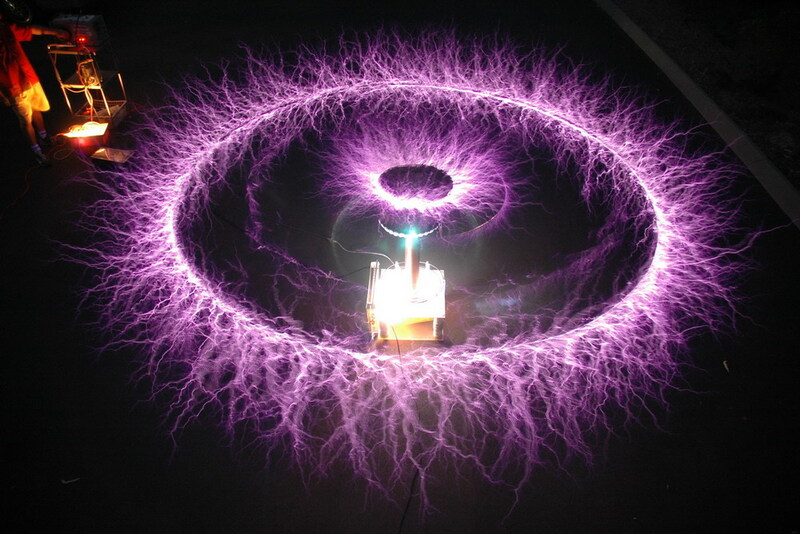 A few great photo’s of Tesla coils generating high voltage. I’ve written this post because my old buddies from my student years have re-instated our internet group, the ”Tesla-Net”. And I thought it was high time I payed my own tribute to this great man, the architect of our time. I love Tesla, the unsung hero of the modern world! There was a movie called The Prestige that had David Bowie playing Tesla. That was awesome! Aw! I didn’t know! Good choice for actor. Thanks for sharing, must get it. 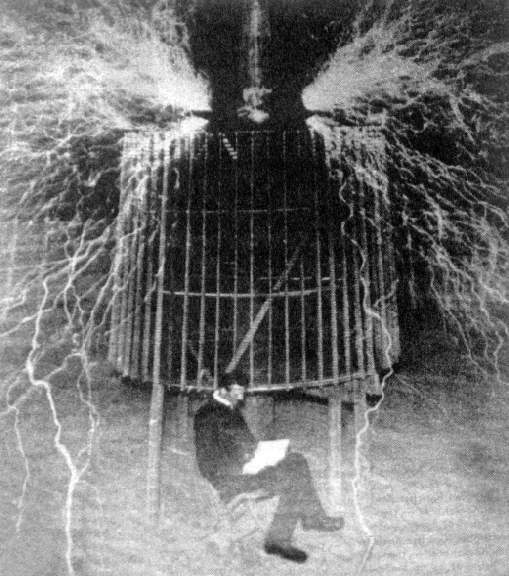 I ❤ that picture of Tesla reading a book under his invention. 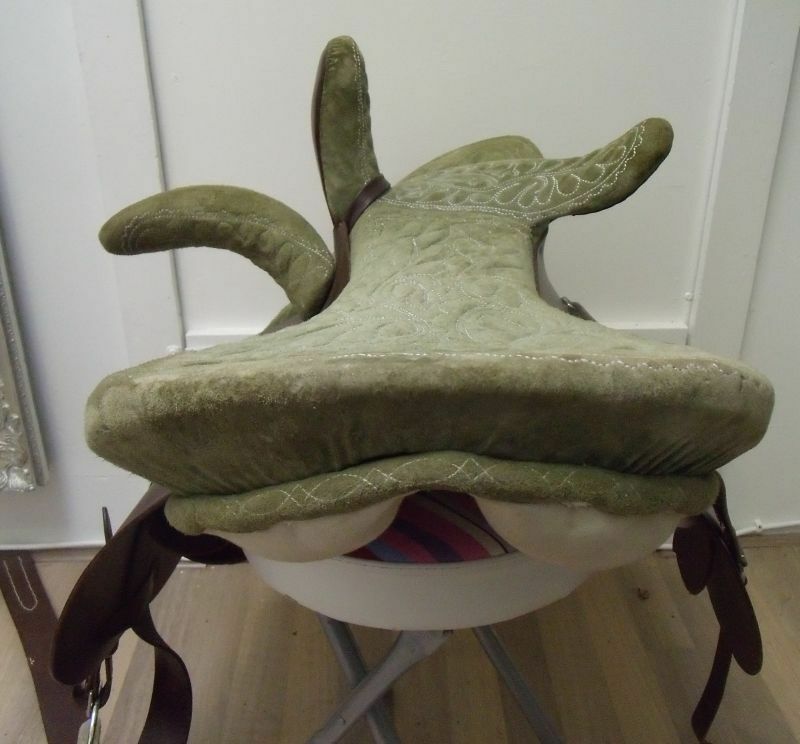 I've had it since childhood in a science book and my fascination with it hasn't lessened with time! The science geek in me just LOVED this post! Thanks Aafke! Tesla’s one great personality and so much talent in one man is just awesome! Susie, he deserved to be wealthy, but wealth always eluded him and he was constantly trying to raise funds from investors. Word has it he died broke, a real shame for what he contributed to this world in several technological advances. What a great and informative post. Enjoyed this. Thanks! Nice! Tesla baby…sort of like Edgar Cayce in the visions department. Cayce also commented about having visions that he couldn’t always tell if they were real or not when they happened. Have you seen the new electric car called the Tesla? 0-60 in 3.9 seconds…all electric. I’m certain that the name is all it has in common with the man…but it’s still pretty cool. Nikola Tesla died PENNILESS, robbed by JP Morgan the MFing banker who worked for the richest family on Earth – The Rothschild family. If you love Tesla, and have an account in JP Morgan, just withdraw the money and close the account , for God’s sake! Tesla had a passion for Eastern philosophy, he often used terms like Akasha (Aether) and Prana (Creative force – motion) to describe the mechanics of the Universe. He met Swami Vivekananda during his life. Kural, welcome to my blog and thank you for sharing this. I am Dutch so bank somewhere else, but I will promise never to start an account with JP Morgan! What ever happened to Teslas’ patents? Are there any places to view the great inventors wreath of documents, who was the his estate entitled to? Why are there no books on this amazing man? Ionic is’nt it!!!! Free Energy will unleash human creativity to open up the sky and bolt forward to the beginning, paradise for all! Why oh why, especially given the recent oil leak catastrophe, are we, or at least our governments, still pandering to these world energy barons. Why are they not releasing and manufacturing the means to free or even cheap electricity. What a downright shame that a few greedy men will allow the earth to be destroyed because of their greed for money and power. Shame on them and shame on the governments that allow it. I believe that all Tesla technology should be available to the public. Not just the cars, yet all areas to exploit the greater features of man kinds capabilities. Going beyond what we believe we can accomplish we must imagine the impossible becoming possible. Where there is a molecular building level it can be changed or altered to create new things. All things are molecular. 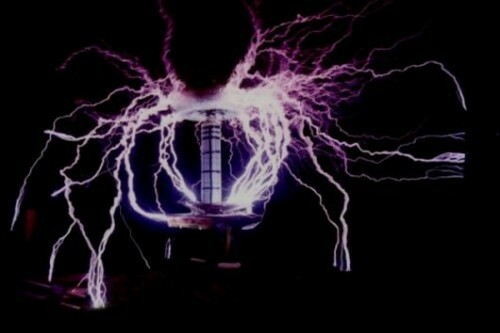 If I had to put the idea of tesla´s world tower (Wardenclyffe Tower) in a nutshell and conclude on that, it would be the following: If earth is an electric body, the rest of the surrounding universe must be an electric system, like we find it in molecules. This means, that we not only can benefit from the energy contained or circulating in our stratosphere (which equals the output of approximately 100 nuclear powerplants per day) but from the reciprocal action earth itself is a part of. Same theory just at a larger scale. The problem with that is, and that´s why the wardenclyffe project was cut off fundings, unlimited energy would reduce the production cost of any kind to zero. Energy is required to build machines, to produce food, cleaning water, drive engines and on and on and on. If that would be accomplished, the only currency would be knowledge and their lies no profit in it if knowledge is not bound to being transformed into coins and bills. Economic theories would be proven absurd whether it would be Adam Smith or Marx. Unlimited energy would negate the limitation of ressources, because the limited ressources mainly are used for producing energy (oil, coal, gas, uran). 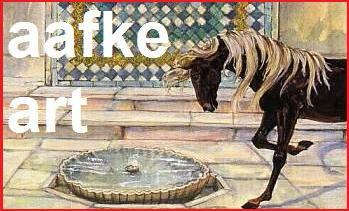 The only ressource it can´t negate is the ground. Besides that, think about producing vast amounts of energy without co2 emissions. I know this sounds utopically and we can´t see the consequences of interferingin the cosmic enrgyflux, but if we compare the scale of the human needs and what energy flows around only in our solarsystem, it might not be of importance. 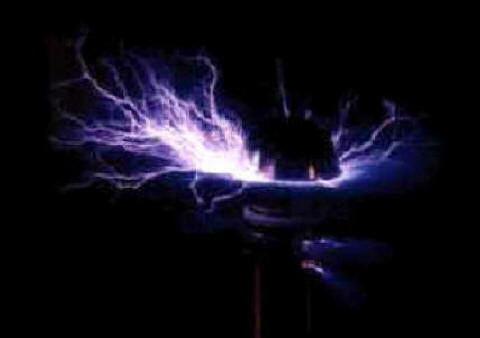 Another question that rises for me is: Is the human race capable of handeling the benefit of unlimited energy? Wouldn´t it rise other issues to argue about (e.g. religion) and what kinds of weapons would it give birth to? Unlimited energy would be quite risky to give to a race which has proven how creative it is to transform energy into tools of destruction. Actually I do not think the human race is ready for free energy. But I also think it’s high time for the world to recognize Tesla for the genius he was and look into his patents and inventions which he never realized. I think we are missing out a lot by not doing so. Check out Against the Day by Thomas Pynchon. Tesla is a prominent actor in this incredible novel, which is set in an age that not only had more optimism than ours, but also had a greater awareness of the real enemies of the good life for the people, i.e. the plutocrats. H Henry the horse! I will get the novel! Thank you for recommending it, and welcome to my blog! I am starting to find out there are people all over the world who admire and remember Tesla! well as prices of those u do have in stock and hope to hear from you soon. You wrote his name wrong, it’s not Nicola, it’s Nikola. 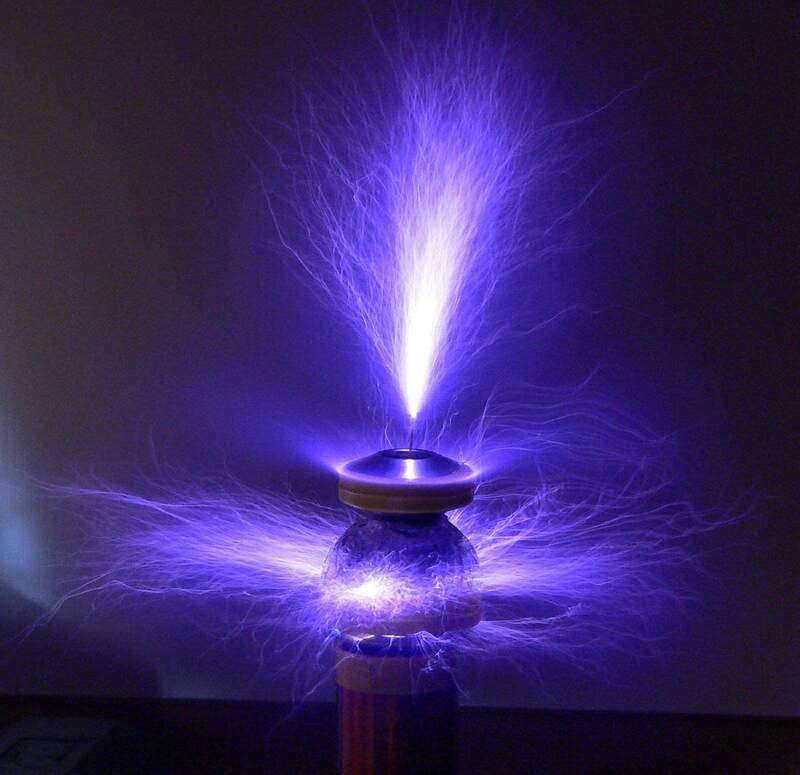 I have built a number of his projects including a couple of Tesla Coils. No matter how much I read and study I still stand in awe of his genius. The world hasn’t been fair genius; He should be remembered as the genius whom ushered in the modern era. A noble prise why not now? Yes, why not, the money can go to a Tesla project! I have read about Tesla’s free energy concepts in Nexus magazine, but I had no idea that he was such an inventor of pure genius. It is indeed criminal that his ideas are not being brought to fruition to save the planet we live on … as a result of the grip that the greedy energy companies have on our governments. Hang on a minute, WE elect the governments do we not? Perhaps in the same way that change is being forced upon many middle eastern by popular uprisings, we will see the light and decide to force our governments to stop being blind and/or inward looking, and embrace this technology for the good of all (except the big energy companies!). Only then will Tesla get his well deserved honours, of which he is overdue many. I have read about Tesla’s free energy concepts in Nexus magazine, but I had no idea that he was such an inventor of pure genius. It is indeed criminal that his ideas are not being brought to fruition to save the planet we live on … as a result of the grip that the greedy energy companies have on our governments. Hang on a minute, WE elect the governments do we not? Perhaps in the same way that change is being forced upon many middle eastern countries by popular uprisings, we will see the light and decide to force our governments to stop being blind and/or inward looking, and embrace this technology for the good of all (except the big energy companies!). Only then will Tesla get his well deserved honours, of which he is overdue many. .. wow ! i’m too . shock ..! for what Nikola Tesla .. contributed ..
. his invention to us .. 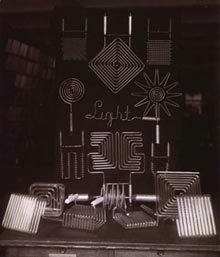 Someone asked about Tesla’s work and where it could be seen? Tesla was Serbian, so after his death, all his stuff “after US officials went through it” were shipped to Belgrade Serbia. A Museum of Nikola Tesla was opened where all his work and papers are available to the public. Here is is the web presentation of the museum: http://www.tesla-museum.org/meni_en.htm and if opportunity takes you to Belgrade one day, wisiting this museum would not be a waste of time. Love your web site! 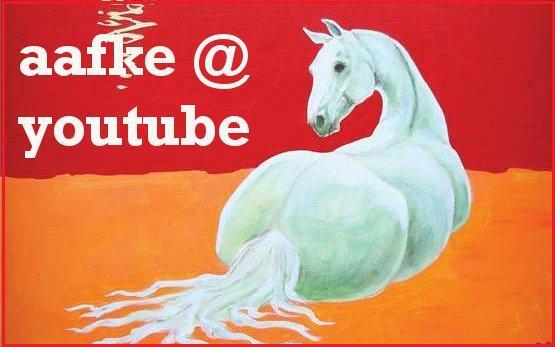 Like yourself I too view horses as the “apex” of perfection. Tesla, true visionary, still totally underrated, amazingly so. Keep up the good work! I am awaiting updates!